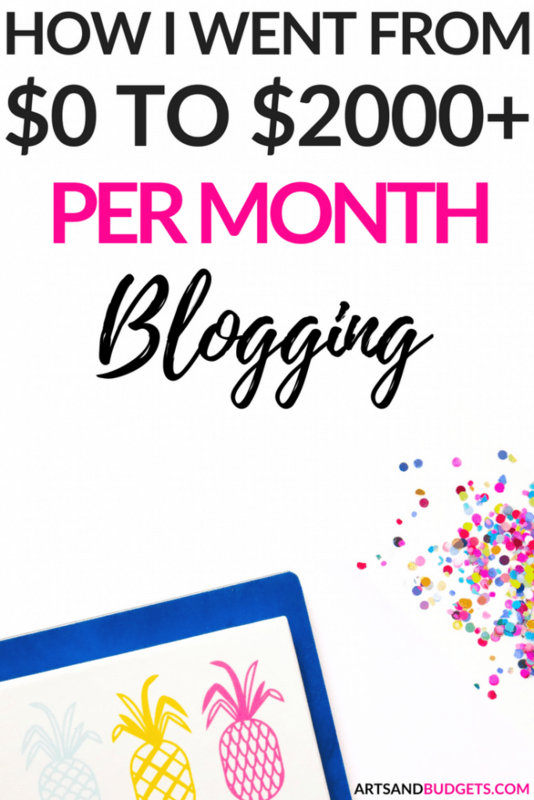 Have you been blogging for years and still trying to figure out how to make money from blogging or did you just start your blog and clueless on how to get started with making money from blogging? If you raised your hand for any of those, you totally in the RIGHT place. I started my blog a little bit over a year ago and when I started my blog I knew that I wanted to create an outlet for creatives to help them grow their blog + biz and give them resources on ways to side hustle. I also knew that I wanted to turn my blog into a full-time business so I focused on building a solid foundation for my blog before I monetize it. Building the foundation for a blog is super important to developing a “profitable” blog that you can monetize. So, I often suggest developing a strong foundation by creating amazing content filled with ways to help your readers solve a problem and creating a strong brand for your blog that your audience will recognize anywhere online. After that, it’s time to start thinking of ways to make money from your blog. 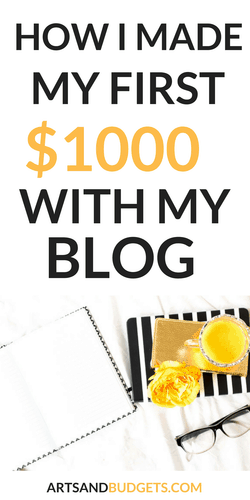 In this post, I will share some ways I monetize my blog and how I make over 1k every month with it. Great content is the lifeline of your blog and is a must to have a profitable blog. Some factors that are important when writing killer content are, posts with a ton of value that are at least 1000+ words, posts that motivate your readers to take action and well-written posts with no grammatical errors. For each of my blog posts, I make sure write over 1500+ words and I make sure to pack them with a ton of value that can help my readers grow their blog + biz or make extra money through side hustles. You want your readers to leave feeling like they gain something new that they can apply to their blog. Ultimately, you want to help your readers solve a problem. Think about, have you ever read a post and left feeling like you didn’t learn something new? I know I have and if you have too, odds are that you probably didn’t return back to their site or sign up for their email list, right? So a blog post should be filled with a ton an awesome content. If you are looking for a post that shares what to include in your post before you publish it check out this post by clicking here. It shares a ton of tips on what to include in your post before you hit publish. Knowing your audience is super important for your blog + biz. If you don’t know your targeted audience, who will buy your latest product when you launch it or buy your Ebook when you put it up for sale? So, before you think about monetizing your blog make sure that you have an audience (small or big one) and know who they are. If you aren’t sure who is your targeted audience, think about the type of people you want to attract to your blog. Are you a mom blogger and want to attract moms that are looking to make extra money or are you a personal finance blogger and want to connect with others that want to learn how to save money and get out of debt. Really think about the type of audience you want to connect with and focus your content around them to help them achieve their goals. Another important lifeline of your blog + biz is your EMAIL LIST. If you want to connect with your audience on a higher level creating an email list will help with that. Having an email list is also really important if you want to sell products such as Ecourses, Ebooks, and guides to your audience. Growing an email list is also a really great way to build trust and relationship with your audience. Your readers can become a part of your tribe and will probably be more likely to buy your new products and support your blog + biz. If you are looking for tools to rapidly grow your email list? Check out this post! Do you know how I made my first paycheck from blogging? I actually made my first paycheck from blogging using affiliate marketing. I am an affiliate for different survey companies and at that time I earned my first $100 by suggesting different survey companies to my readers that were looking for ways to make extra money. Previously, I tried out the survey sites and loved them so I shared them with my readers as well. I only share products or websites I have tried and love to my readers. So, what is affiliate marketing? Affiliate Marketing is awesome because you get rewarded for recommending and promoting products and services that you love on your blog. Every time someone signs up or buys a product through your referral link from your site you will receive a commission for that sale. For example, if you are an affiliate for Amazon.com and you post your direct link on your website of a specific product, you will get rewarded every time someone buys that product through your link. I recently wrote a post on how I made over $1800 blogging in one month and most of my income for that month came from affiliate marketing! Some of my favorite affiliate programs to check out are ShareASale, Bluehost, Shopify, IGain, Offer Juice, and Flex Offers. So, if you have an idea and you love to write you can totally create an Ebook to teach your audience something amazing. In the process, you will be able to grow your business and generate passive income. If you are passionate about a topic and knowledgeable about it you can totally develop an E-course for your readers. E-courses are totally on the rise and are becoming one of the main sources of income for a ton of successful bloggers such as Melyssa Griffin, Kristin Larsen, and Elna Cain. If you don’t think you can teach anything, let me be first to tell you can totally can. Everybody can teach something even if they just started blogging. Really focus in on what you are strong at and what others ask you for help on. Those can be starting points to developing your Ecourse. I have jumped on the Ecourse ship, and my new course will be launching within’ the next 3 weeks. Woohoo! The course will focus on how I use Pinterest to boost my traffic and how I use Facebook groups to rapidly grow my engagement on my blog. It will focus on how I use Instagram to develop a solid connection with my audience. Some online platforms that you can develop e-course online for free are Teachable and Thinkific. Another way you can earn passive income monthly is by placing ads on your website. I just recently got a payment from my ad company for over $600 for my ads placements for the month of June. With ads, the ad company places ads throughout your site and basically, you get rewarded every time someone comes to your site and click on any of the ads. I am currently with Mediavine ad company and I love working with them. With Mediavine, you have to get at least 25,000 sessions per month which normally equals to at least 35k+ page views per month from your blog. Some of the other ad companies that I have heard great things about are Google Adsense (anyone can join but it takes a while for you to actually make “real” money from this ad company), and Adthrive (you need at least 100,000 monthly pageviews to join this ad company). So, there you have it, some tips and ways to help you make your first $1000 this year! Do you currently make money with your blog? If so, share how and what works best for you. Awesome tips! I’m focusing on affiliate marketing for now but would love to consider courses and e books in the future! Very informative! I’m working on monetizing my blog. Great advice! Great tips to bloggers. I think I need to try on selling my own stuff. When you start blogging, they don’t tell you how much work goes into it! It’s not just about the blogging and content, but the promotion. Phew! I do love connecting with other bloggers though. It’s such a fun community. Aw man. I need to grow my readership then. I only get 5k a month! I’ve been tossing around the idea of monetizing my site – maybe sometime soon I’ll try it out and see how it goes! This name great advice and resources to help bloggers. Thank you for sharing! I will definitely be looking into the ones I don’t already use! These are such great tips! I’ve been trying to monetize my site and this is really helpful! My email list is definitely something I’ve been thinking s lot about and want to focus on more. Right now I’m just kind of gathering email addresses. I’ve been looking for some new ways to monetize my blog. I’m going to check some of these out! Thanks! This is a great post, awesome tips on how to make money. Thank you for sharing this. I am gonna check out some of those links you have attached. Thank you for these tips! Will definitely try them. Awesome tips!! I’ve just started with affiliate marketing and have thought of writing an ebook as well!! Thank you for sharing! Congrats on your success! And thank you for sharing the tips that helped you get there. This will definitely be useful for me and the goals I’m trying to achieve this year with my blog. Interesting perspective, it seems to me that to produce a passive income takes a lot of effort upfront before it becomes passive! But you are right, these are some great ways you can do it if you can put in the effort upfront!